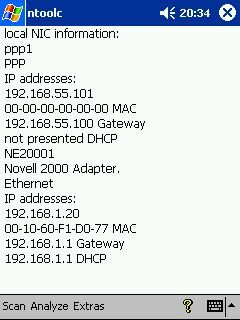 your local Network Interface Information, the Gateway and DHCP Server if available. NToolc Network Polling, poll your entyre Network for all IP Nodes, see how fast is your Network answer on the Speed Bar, get Mac Address, RTT and count recieve Bytes from every Host is up. You can also doubleclick on every entry in the Listbox to get more Informations from the selected IP Node. The results can also be saved in a Text File for export or load again in the NetAnalyzer for later work. 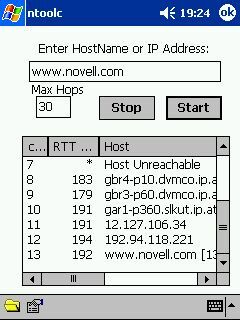 This Screen is from a doubleclicked Node, in Traceroute, Ping or Network Polling Utility. Here you can do fast (100 Mbit switcht Network / local Networks) or slow Portscans on a Portrange or a list of Ports. This Dialog also performs MIB SNMP Browsing. The results can also be saved in a Text File for export or load again in NToolc for later work. 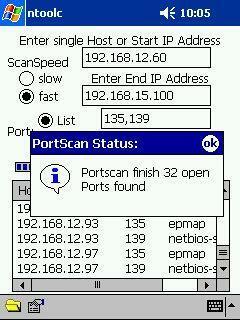 This is the Main Screen form the Network Port Scanner. You can do fast (100 Mbit switcht Network / local Networks) or slow Portscans on a Portrange or a list of Ports. This is the Telnet Screen, you can connect on any open Port found with the Port Scanner Tools by doubleclicking there corresponding entry in the Result List and also you can start Telnet as a single Tool. 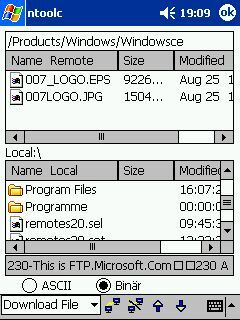 With the integrated FTP Client from NToolc you can connect to any FTP Server and download Files, also Uploads are possible. With the NSlookup Tool can you Test your Network Domain Name Server configuration. 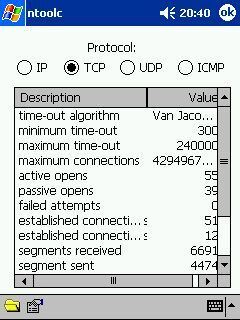 At any time you can have a look into the detailed Protokolstatistiks for IP, TCP, UDP und ICMP. This can help to detect failures on Wire and or Network Interface Cards. You can Ping any IP Node on your Network for getting Informations how fast he anwers RTT, count Bytes recieves und the MAC Address from the Network Interface Card. The Traceroute Tool gives you the possibility to see the steps your Network Pakets goes, to reach a Host or Network. Traceroute also performs doubleclicking on any Host entry in the Result list, for getting more Informations on the selected Host. 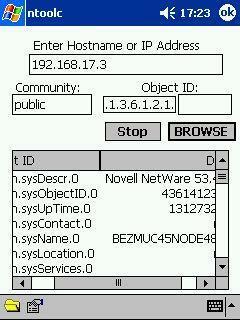 With the MIB SNMP Browser you can see any kind of Informations the MIB from your target Host suplies.